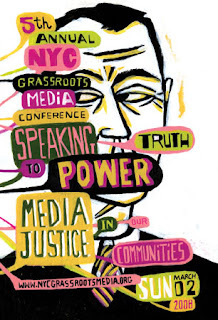 I will be participating in the NYC Grassroots Media Conference on March 2nd with my colleagues talking about connecting teaching strategies for visual literacy and media literacy. I’m really looking forward to this conference and hope those in the NYC area will make it! If there’s nerdy media, art and museum educators coming to the conference, I hope you’ll make it to our workshop! This entry was posted in New York and tagged Conferences, Independent Media, Media, NYC Grassroots Media Conference, Workshops. Bookmark the permalink.